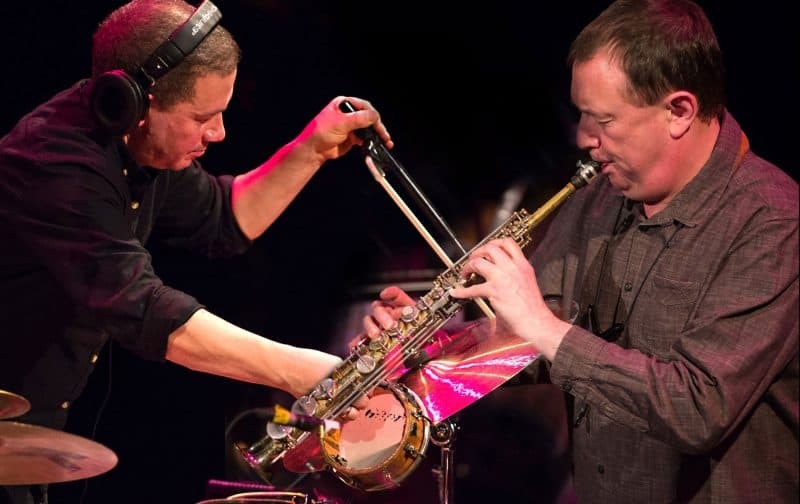 hcmf// is proud to be presenting Tarab Cuts, a work from UK musicians John Butcher and Mark Sanders, at Irtijal 2019. The project will be presented at the Beirut festival on Friday 29 March 2019. Supported by the British Council, Tarab Cuts continues hcmf//’s commitment to presenting work overseas, following on from editions in Barcelona and Philadelphia, as well as concerts in Mexico and Vancouver. It is also a continuation of the long musical history Butcher and Sanders share, spanning 25 years. The duo recently met on stage at hcmf// 2018, performing alongside improviser Steve Beresford for an interpretation of Christian Marclay’s graphic score Screen Play. ‘The genesis of Tarab Cuts dates back to 2011, when Lebanese electronic composer Tarek Atoui invited a number of musicians to create short works for his project Visiting Tarab. The idea was to form a modern-day response to the Arabic music recordings in the collection of Kamal Kassar of the AMAR Foundation, Beirut. British musician John Butcher contributed ‘Between the Skies – for saxophone plus sound files’, created through edits re-composing music from Kassar’s 78s. Tarab Cuts expands this earlier work into a concert presentation – utilizing re-imaginings of many other recorded sources and adding UK percussionist Mark Sanders.